Yep. The butterflies have both a solar compass and an equally fascinating biological clock. Monarchs use the sun's position and movement to judge their latitude and direction, and they use major geographic landmarks, such as the Appalachian and Rocky Mountains, to help keep them on course. Scientists have known that monarchs use the sun as a calendar to tell them when to begin the journey south to Mexico and as a compass to guide them on their way. But a compass based on the sun's moving position in the sky would not work unless the insects also have an accurate clock to tell them the time of day. 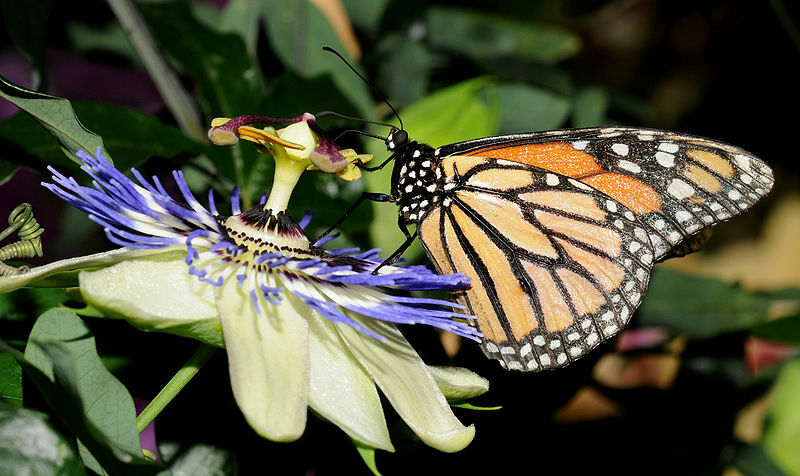 A gene in the monarch butterfly acts as a biological clock that helps the butterfly determine where to fly. The gene produces a protein that is sensitive to light, which counts the hours of the day and sends this information to the monarch's solar compass. So even though the monarch's brain is tiny, it somehow arranges information about time and space that allows it to fly in the right direction at the right time. “Monarchs have a biological clock in their brain, but also one in their antennae that tells them when the sun rises and sets,” says Chip Taylor of Monarch Watch. It's a sun-based compass that contains both a light sensor and a clock: by keeping track of the sun’s location in the sky, the monarchs born in early autumn sense that days are getting shorter, and nighttime temperatures are decreasing (brrrrr), meaning it's time to fly south! 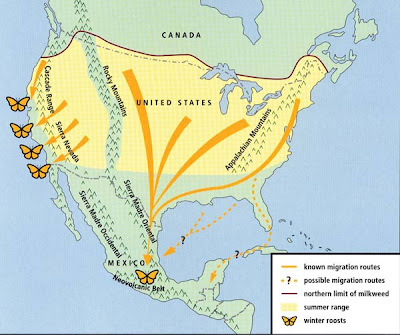 The north-south migration leads the butterflies to spend the winter either in central Mexico (for eastern North American monarchs) or coastal California (for western monarchs). 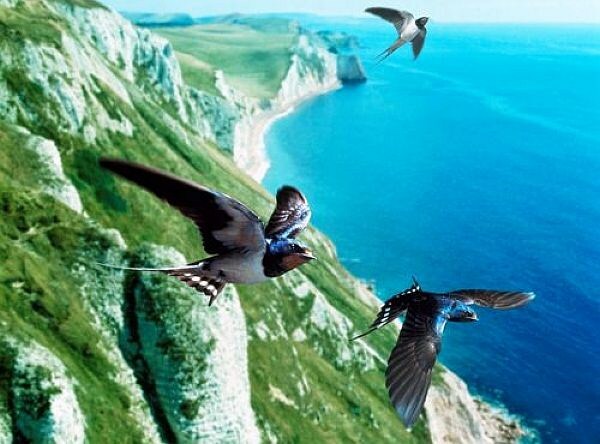 There they start revving up for mating and make the return trip north in late February/March, as days grow longer and warmer again. Recently, scientists in Canada tested whether monarchs kept a “map” of the Earth by examining their flight patterns from two locations. 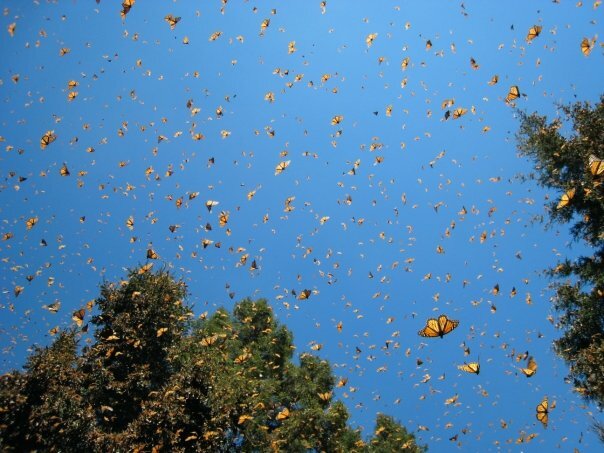 They first set the monarchs free within a flight simulator in Ontario in eastern Canada and watched as the butterflies flew southwest, in the direction of their wintering grounds in Mexico. Right on track! 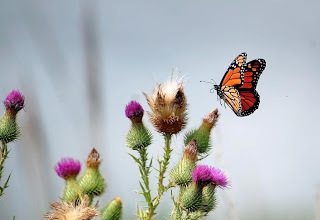 When the scientists moved these same monarchs to Calgary, in western Canada and set them flying again, the butterflies again flew in the same general southwestern direction, rather than adapt to their new starting point. The butterflies’ flight patterns indicated that the monarchs didn’t know that their starting point had moved 2,500 kilometers (1,500 miles). 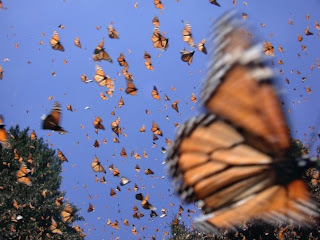 In nature, monarchs that migrate to Mexico do so from the eastern part of North America. Other scientists have thus questioned whether artificially moving the monarchs in this study well outside their normal range, into terrain they would never have entered naturally, was a true test of their possession of an internal map. Monarchs from western Canada and the U.S. tend to overwinter on the California coast, not central Mexico. Perhaps Calgary was just off the map, so to speak, for these test monarchs from the East coast, and perhaps similar tests from sites within the normal monarch migration zone would help us understand the true nature of the monarchs' amazing navigational feats. While the monarchs’ innate assumption that they are in the northeast of North America suggests that they may not judge longitude as well as latitude, it also indicates that new generations must be consistently returning to the same areas every summer. Because their ability to find their way seems to be tied to the trees and groves of their ancestors, the navigation ability of each traveler is key to not only their own well-being but that of future generations. Learn more about monarchs pull this off every year! Follow the Monarch's spring and fall migration via Journey North. 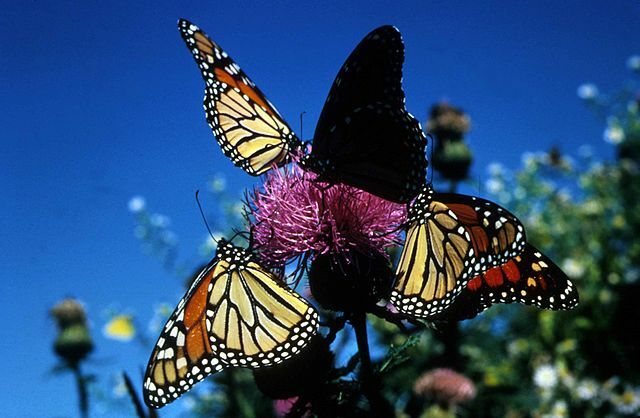 Experts discuss monarch migration mysteries. The University of Minnesota's Monarch Lab provides essentials on monarch biology, migration, conservation. A BBC discussion on how scientists showed the importance of antennae to monarch migration. Learn how the University of Massachusetts Medical School team identified the key monarch gene that serves as their biological clock. Some techniques used by Queens University Psych Department to study monarch navigation.